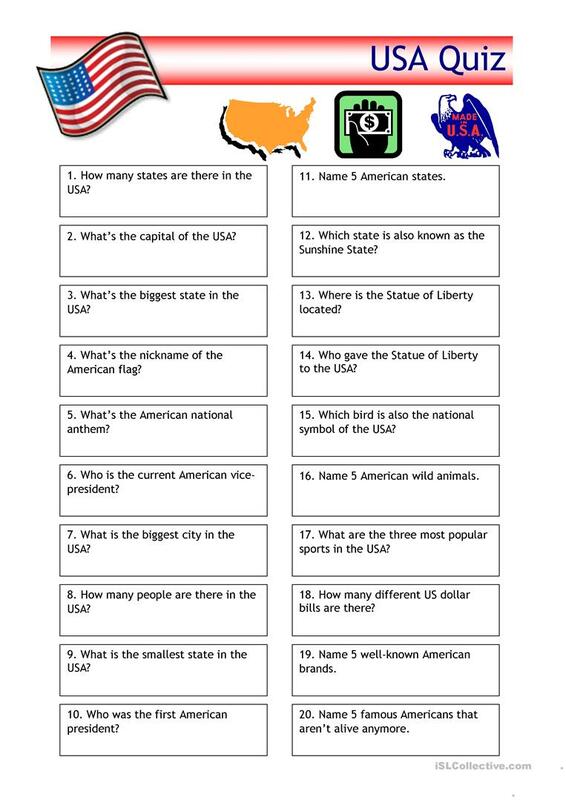 Quiz with 20 trivia questions concerning the USA, suitable for most students (and for anyone who likes quizzes really). There is a mix of easy and more difficult questions. Should they prove too easy, just make it a bit harder by using your imagination - e.g. use the answer in a correct sentence. The present printable, downloadable handout is a great resource for high school students, elementary school students and adults at Elementary (A1), Pre-intermediate (A2), Intermediate (B1), Upper-intermediate (B2), Advanced (C1) and Proficient (C2) level. It is great for practising Questions in English, and is useful for developing your groups' Listening and Speaking skills. It features the vocabulary topic of United States of America (USA). The exercises come with answers.